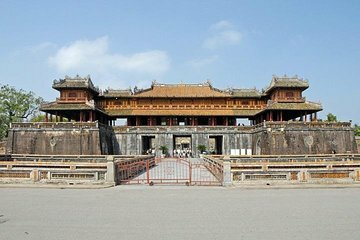 Conozca a Hue, la antigua capital imperial de Vietnam, en una excursión de un día por la ciudad con un guía experto. Conozca la historia de Hue como el corazón religioso, económico y cultural del país bajo la dinastía Nguyen mientras ve atracciones como la Pagoda Thien Mu, el Mercado Dong Ba y las tumbas de los emperadores. También harás un paseo en barco por el río Perfume. Our guide, Ken, I think in Vietnamese Quang was wonderful. He shared Vietnamese history with us, was able and willing to answer our questions as his English is so good. Because there were only two of us on the tour it was an ideal learning experience for us. Ken guided us through several historic sites which were quite varied, allowing us to set our own pace when we were interested in spending longer in some areas. Our driver magically appeared when we were ready to move on and the lunch organized as part of the tour in a garden restaurant was superb. We felt as if we could have been in Monet's garden. Was such an interesting and relaxing day and a wonderful way to end our stay in Hue. Two travellers who are in their late seventies.